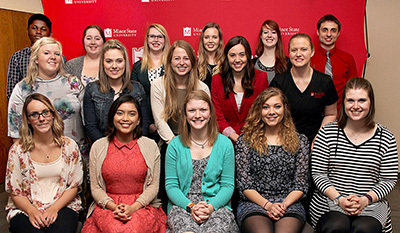 Seventeen Minot State University juniors and seniors were included in the 2017 edition of “Who’s Who Among Students in American Universities and Colleges.” A campus nomination committee and editors of the annual directory picked the students based on their academic achievement, service to the community, leadership in extracurricular activities and potential for continued success. MSU honored the students April 5 at a luncheon. The honorees, listed by hometown, class rank and major, are: Katie Abrahamson, Minot, senior, graphic design and photography; Emilee Baggett, Minot, senior, elementary education and early childhood education; Maleyna Beale, Wichita, Kan., senior, biology; Jordan Busch, Minot, senior, accounting and finance; Kristen de Delley, Brandon, Manitoba, junior, communication disorders; Inga Dudley, Red Wing, Minn., senior, mathematics education; Margaret Flinn, Corvallis, Ore., junior, criminal justice; Chelsea Geis, Qu’Appelle, Saskatchewan, senior, special education; Kendall Green, Winnipeg, Manitoba, junior, communication disorders; Breanne Hatfield, Manteca, Calif., senior, chemistry, biology and mathematics; Morgan Hunter, Invercargill, New Zealand, senior, psychology; McKenzie Kranz, Minot, senior, elementary education and special education; Erika Mojica, La Union, Philippines, senior, biology; Kevin Morgan, Tema, Ghana, junior, international business and marketing; Jayden Moum, Minot, senior, accounting and finance; Else-Marie Nelson, Minot, senior, physical education; and Noelle Padilla, Houston, Texas, senior, nursing. The group posed for a photo at the banquet. Seated, left to right, are de Delley, Mojica, Kranz, Beale, and Nelson. Included in the second row, left to right, are Flinn, Baggett, Hatfield, Moum, and Padilla. Pictured in the third row, left to right, are Morgan, Green, Geis, Hunter, Abrahamson, and Busch. Dudley was unable to attend. For questions, contact Kevin Harmon, vice president for student affairs, at Kevin.Harmon@minotstateu.edu. Minot State University is combining the Northern Plains Conference in Early British Literature with its annual Shakespeare Fest April 20-22. The British literature conference opens April 20 at 7 p.m. with the screening of “Henry V” in Aleshire Theater. Kenneth Branagh starred in and directed this film adaptation of the Shakespeare play. The play recounts the British victory over the French in the Battle of Agincourt in 1415. King Henry V led his troops against a superior French army in the conflict. The Bard used dramatic license to safeguard his thriving dramatic career. Presentations and panel discussions encompass all of April 21 and the morning of April 22. Tom Clayton, retired English professor from the University of Minnesota, will deliver the keynote address, “Shakespeare and the Mediterranean,” April 21 at 3:30 p.m. in the Conference Center. All events are free and open to everyone. For questions, contact Kibler at Robert.Kibler@minotstateu.edu or 858-3876. On April 22 from 9 a.m. to 1 p.m., Minot State University’s Spring Open House will empower prospective students and their families to explore university life. During two First Year Experience courses, the families will learn how to support their students at MSU and about the challenges of transitioning to campus life. The two FYE classes are “Balancing Instinct” with Terry Eckmann, teacher education and human performance professor, and Karina Stander, wellness specialist, and “Robots and Makers” with Warren Gamas, teacher education and human performance associate professor, and Dan Ringrose, Division of Social Science chair. Guests may tour the residence halls, and prospective students can “Build-a-Beaver” with current students. After lunch provided by MSU, accepted incoming freshmen may select their FYE courses as a bonus perk. RSVP or view details on speakers and events online. Dan Conn and Joe Zajdel, assistant professors in teacher education and human performance, will offer their insights on public education reform in “Hidden in Plain Sight: Market Influence on the Classroom” April 24 in Aleshire Theater at 7 p.m. Their presentation, which is free and open to the public, is part of the Northwest Art Center lecture series. Conn and Zajdel will offer insights and criticisms about proposed education reforms based on their recent research that will be featured through the American Educational Research Association and forthcoming book chapters. They stated that their lecture is intended to encourage “a larger dialogue aimed at re-imaging school.” Shelby McCabe, Student North Dakota United-MSU president, will help moderate the discussion. Pictured, left to right, are Zajdel, McCabe and Conn.
An informal reception will follow. This program is funded in part by a grant from the North Dakota Council on the Arts, which receives funding from the state legislature and the National Endowment for the Arts. For questions, contact Avis Veikley, Northwest Art Center director, at Avis.Veikley@minotstateu.edu. Rick Watson, communication arts and humanities instructor, will present “Cafeteria Blues’” April 26 for The Two-Minute Lecture Series. He will be in the Beaver Creek Café by the curved wall at 12:30 p.m.
On May 3, Robert Kibler, co-chair and professor within the Division of Humanities, will close the Two-Minute Lectures with “The Sinister Side of the Pastoral Tradition.” For questions on the series, contact Kibler at Robert.Kibler@minotstateu.edu. The 34th annual Gala Dinner and Auction will commemorate Minot State University’s history, its alumni, its students and its future April 28 at The Grand Hotel, Minot. The social and silent auction begin at 5:30 p.m., with dinner and live auction to follow. The event comprises a gourmet dinner, music and elegant atmosphere. Attire for this event is semi-formal. For questions, contact McKechnie at Janna.Mckechnie@minotstateu.edu or 858-3373. April 12-May 4 — MSU Juried Student Art Show, Hartnett Gallery. 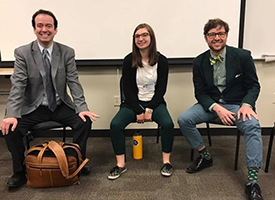 A public reception for “Mugs and Monsters” April 20 in the Library Gallery from 6 to 8:30 p.m.
Ash Bowen, assistant professor of English, had a poem, “Science Bee,” accepted for publication for the summer edition of the American Poetry Journal. Joe Collette, assistant professor of geoscience, J.L. Isbell and M.F. Miller co-authored “A unique winged euthycarcinoid from the late Paleozoic of Antarctica.” It was accepted for publication and will likely be in the May/June issue of the Journal of Paleontology. Guy Hanley, assistant professor of science, along with Smithsonian emeritus professor Robert Gordon, recently submitted a paper to the international entomological journal Insecta Mundi in which they revise the South American ladybird beetle genera Prodilis, Neaporia, Cephaloscymnus and add Succinctonotum and Ponaria as new genera. Based on genitalic structures, 107 new species are described. This work provides a better understanding of the vast South American beetle fauna, and could provide new directions in bio-control research as ladybird beetles are important plant pest predators. Sayeed Sajal, assistant professor of mathematics and computer science, co-authored with B. D. Braaten, North Dakota State University professor, “Implementation of Self-Healing Techniques Using 97% Carbon Content Graphene-Based Conductors on Flat and Conformal Antennas.” It was presented at the IEEE Red River Valley Conference March 31 in Fargo.